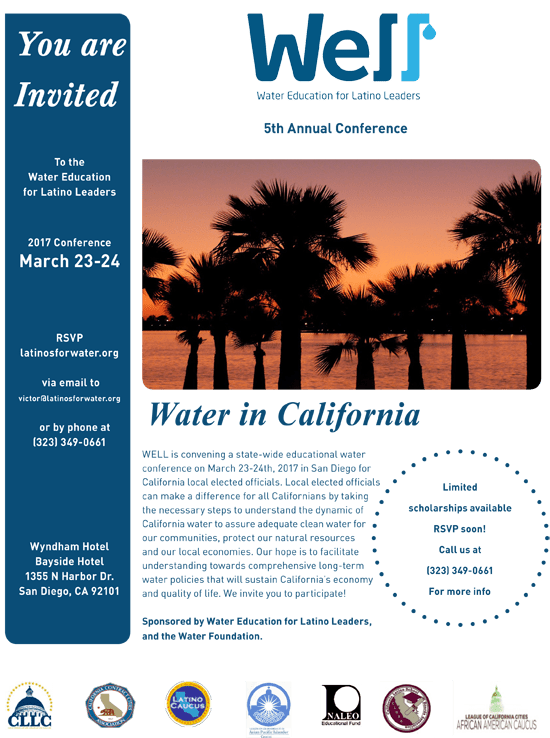 WELL is convening a state-wide educational water conference on March 23-24th, 2017 in San Diego for California local elected officials. Local elected officials can make a difference for all Californians by taking the necessary steps to understand the dynamic of California water to assure adequate clean water for our communities, protect our natural resources and our local economies. Our hope is to facilitate understanding towards comprehensive long-term water policies that will sustain California’s economy and quality of life. Limited scholarships available, RSVP soon! Call us at (323) 349-0661 for more information. Sponsored by Water Education for Latino Leaders, Water Foundation, & Public Policy Institute of California. To download the flyer for the conference, click here.